"When we started WesCOT we said to ourselves "Could we find a way where [guests] are not just looking at he France Pavilion or the Japanese Pavilion but actually saying "That's where I want to stay" and having that be your headquarters for your whole visit to Disneyland. That's half of WesCOT. The other half is the Future World pavilions, where we're actually creating a role where the guests will be able to step on stage into a role in tomorrow and it's going to be a lot more participatory, a lot more theatrical. So you won't have those big pavilions that we have in Florida but once you step inside our theater and walk from the audience side onto the stages of Land, Living and Science, we'll ask a little bit more of you. It's sort of like what we did in Toon Town with fun but in WestCOT we're going to do it with some powerful thinking." "Across from the lake is Future World and like I mentioned it's like going on stage. We only have one icon so instead of all the different pavillions competing architecturaly, we only have one space. You'll walk under the cascading waterfall into the lobby and there'll be gangways leading to the stages. Inside those stages we have 3 wonder areas, in combination with the Four Wonders of the World, will give us The Seven Wonders of WestCOT. That will be a catch phrase at WestCOT. Nature is quite large because it not only contains some new things that we don't have in Florida but it has the growing areas as you have seen them in Walt Disney World and the Seas Pavilion as part of Nature. This building alone will is the same size as Walt Disney World's Seas Pavilion. I used to say to everyone: "Think of a Price Club and taking out all of the stuff and making it about 20' higher than that." (laughter) It's on 2 levels. . . . The [Nature] area will have everything from a fozen environment, which will actually be cold and refrigerated so you can actually play with the ice and snow to an arrid desert and a humid jungle area. This is all new. This is going to be an area that you can actually go into as well as going the under the water in the Seas pavilion, pretty much as you know it at EPCOT. . . .The growing areas in the Seas and the Land will be open as a more major attraction. In Florida you have to reserve a trip to go through there and here we'll make it more of a standard event. Living combines Wonders of Living from EPCOT [Cranium Comand, The Making of Me] and Journey into Imagination, also from Walt Disney World [which will feature unused concepts from the Figment/Dreamfinder ride differentiate it from EPCOT] . Science is a whole new area. We've got a big show called Cosmic Journeys [a combination of film, simulation and 3-D similar in theme to Adventures Thru Inner Space and the reverse: a powers of 10 view of the universe] and a tremendous amount of interactive things that involve kids and learning about future roles they might have in the world we live in. One of the things we tried to analyze is what is it that turns kids off and causes them riot today as opposed to being excited about getting a job. One of the things we realized is that people today are doing jobs that many people don't understand. If you are living in L.A. looking at people coming into those glass towers and sitting in front of computers all day, it doesn't makes the sense of hundred years ago when people watched their family plant food in a garden or making furniture and all these trades that made growing up not such a mystery. So one of the real key thing that we want to do in here is create hands-on activities where kids would understand everything from something that would be fun to do like animation to something that would be technically boggling like designing computer parts for automobiles. We hope that when you come away from those experiences you will have less fear and apprehension about becoming a part of that world." "We put America here at the beginning of the experience because it's linked to Disneyland with the train station and Main Street being Walt's symbolic gesture to the heart of America. The entrance to America would be similar to the Centenniel Fair in Philadelphia a hundred and so years ago. The grand promenade and interior space woud be the gateway to the Americas with South America and Mexico on this side and Canada over to the left and America itself with the American Adventure show in the middle." In Florida it's just a restaurant with a placid lake so we're going to dramatically bring that to life. In the other area is the Aztec and Incan cultures in South America and Mexico and we'll have a very mystic show about the spirits and legends of South America and Mexico. There will also be native dancing on the outside in front of that space." Tony then talked about the "World Cruise" boat ride: "The promo film for WestCOT talked about World Cruise. It's the longest ride we've ever done: it's 45 minutes long, it has 5 stops and in between that there's like 9 minute stretches of ride. So that's about as long the Jungle Cruise curently is. You'll be touring all the outdoor sites of the Four Corners of the World as well as going into show boxes where we'll tell the stories about the different areas youre coming to or leaving. For instance, if you were leaving Asia and going into Europe, you would go into a space and--very much like Spaceship Earth--you would see the forming of ancient Greece and Rome and the burning of Rome and then the resurgence and the rennaissance. After Michaelangelo paints the Sisteine Chappel as he does in Spaceship Earth, we would emerge out of that building and be in Rennaissance Italy and you're invited to step out in that experience: amid all the entertainment, shops and restaurants. 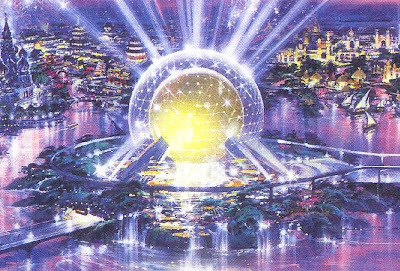 One of the things that we found out when we analyzed EPCOT is that many elements are out of context. For instance, the Sisteine Chappel is in Spaceship Earth, the Mona Lisa is being painted in the World of Motion but the Italian and German pavilions are way out on the other side of park. So we've tried to index all of that so on the World Cruise you'll get all of those story points that encompass the dawn of the earth's history up through modern times and then at 5 key points you'll be invited to step out if you wish or continue on with the story. They all had to be designed as 9 minute shows because we have no guarantee where you're going to get on. So each story is complete and sets up the next stage." "Going on now to Europe, because of the size restriction here, we weren't able to have each individual country the way they do in Florida. That would take up the whole parking lot alone without any Future World but by pooling countries together like Germany, Italy, England and France, you'll feel more like you're in a land than you do in Florida, where you barely get in and that's the end of the pavilion. You keep being reminded that you're along that lake. Here you'll be able to really get lost back in the bi-ways and when you look up it won't be a fake set in the window it will be somebody living up in that space [hotel guests]. So I think it's going to be a much more environmentally complete space. We have an attraction, Tivoli Gardens, in the front here. We've tried to integrate children's rides throughout the park because another problem we have at EPCOT is it's mostly films and travel information and shopping, which children don't find that attractive. So w've got something at each stop which we hope will be appealing to all age groups. 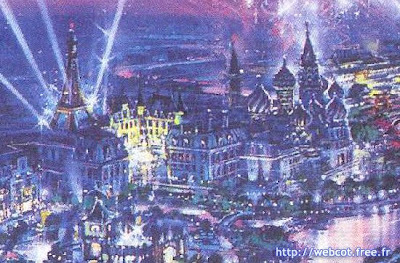 There's a CircleVision show in France that we did for Euro-Disney, "From Time to Time," It's with audio-animatronics...Hidden under the acropolis here is the show space where guests will see the dawn of Europe and the blossoming of the rennaissance." "...In the courtyards going from Germany onto Italy and the canals are the areas where the World Cruise will travel...The larger buildings in the back can be acheived because we have 5 and 6 stories to work with in the hotels, that they don't have to work with in Florida. Another reason for that is that in the 30-something years that Disneyland's been open the outside surround has gotten a lot more developed and grown up and we can't hide that anymore with new trees. So having 6 story buildings in the back is going to give us the block that we need. And then on top of the hotels we'll put set pieces like St. Basil's from Russia. We were very hot on doing a Russian pavillion and we were very close to doing it in Florida and then the whole economy changed over there. We have a completed show that was read to go and maybe it will come to life here in WesCOT." "Going on to Asia, this building combines the Indian palace in the back, which is a hotel stretching over into China and Japan. In the foreground is SE Asia and there's a carousel of mythic Asian animals primarily for the children as well ethnic foods along the lake. There's a Japanese show in the main pavilion over here and Ride the Dragon, which is a Chinese festive dragon that travels up and down over the Dragon's Teeth Mountains. When it gets up to the higher altitudes, so you won't see the Emerald Hotel, we have silks that come down over the side of the coaster and enclose the guests in a festive dragon. . . . The silks will be in the up position when you load and then when it gets going really fast we'll bring them down and it will be like in a worm hole from a Star Trek movie. That'll keep you from seeing things that you shouldn't see too. . . . 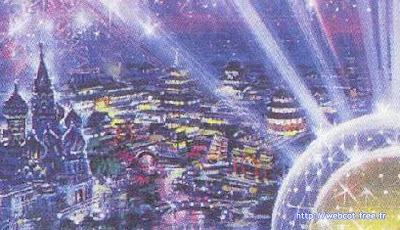 It will be a striking piece to see both from Disneyland Drive on the outside as well as providing a rather effective backdrop inside the park. . . . A lot of these ideas were lifted from the original EPCOT concept so we'll bring back The Temple of Heaven for China." "There was a concept for Africa and the Middle East that we're kind of sorry we didn't get to do. Micheal Eisner is always trying to stretch everybody to do things that are very difficult. One of the shows we had in here was The Three Great Religions of the World. He said "I want you to do a show that everyone will enjoy and will find perfectly in concert with their particular religion." (laughter) So we had settled on depicting the 7 days of creation and avoiding all of the problems between the Muslim and the Jewish and Christian versions of that. And we were getting very excited because we were starting to deal with 7 of the great artists of the world and trying to have them depict each of the single days that they had been given. Maybe that will happen later. The Three Religions would be a little olive garden piece and you would step into the pre-show and go into the main area." When the imagineers realised that the 300' golden ball would look terrible from Main Street and dominate the skyline far too much, they searched a new icon for the park, and the new concept introduced a giant golden spire. All my thanks to my friend Guillaume of the excellent WEBCOT web site for the renderings that illustrate this article. All artwork: copyright Disney Enterprises Inc. Fantastic post and site. Keep it up. Thank you for posting these. 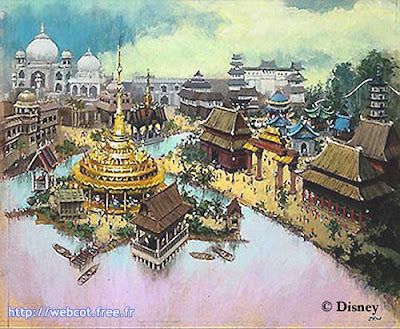 It's a pity that this place was never built, and instead we got DCA. 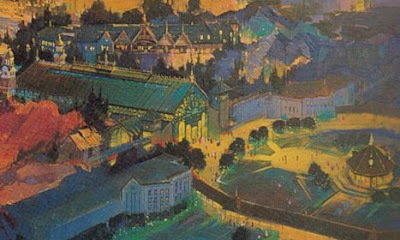 Maybe waiting until the time was right to build WESTCOT would've been better than putting in some new park, just for the sake of putting in some new park to pair off with Disneyland. Thanks for the hard work you put into this. I would have much preferred a park not based on EPCOT. I'm not a fan of cloning. Thanks for the article and artwork. I'll point out that if Baxter's presentation was in 1994, it was after they had switched the design from the blueish, Spacestation Earth images above to the spire design. 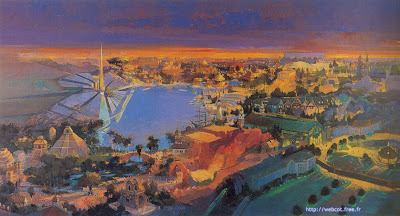 I recently did a story about the Port Disney/Westcot debacle at my blog. I will forever mourn Westcot's loss... it looked brilliant. Just wondering if eBay allows you to market [url=http://www.ticketchoice.com.au]concert tickets[/url] on the web? Do you know if you'll find any restrictions based on what country you're in? My parents have just known as me and asked if i could "get rid" of their two tickets to a concert as they wont be able to make it due to an additional family event. Apart from asking close friends etc, i thought ebay would be a good place to market them. But whats ebay's policy on selling tickets? Ive heard alot about it within the news but ive forgotten what happened. Thanks ahead of time for the advice. Final WALL-E trailer at last released !